is a professor of psychology at Johnson State College in Vermont. Her research is focused on emotional development in childhood. Before they speak or crawl or walk or achieve many of the other amazing developmental milestones in the first year of life, babies laugh. This simple act makes its debut around the fourth month of life, ushering in a host of social and cognitive opportunities for the infant. Yet despite the universality of this humble response and its remarkable early appearance, infant laughter has not been taken seriously. At least, not until recently. In the past decade, researchers have started to examine what infant laughter can reveal about the youngest minds, whether infants truly understand funniness, and if so, how. Prompted by observations of infant laughter made by none other than Charles Darwin himself, modern psychologists have begun to ask whether infant laughter has a purpose or can reveal something about infants’ understanding of the world. Darwin speculated that laughter, like other universal emotional expressions, serves an important communicative function, which explains why nature preserved and prioritised it. Two key pieces of evidence support Darwin’s hunch. First, according to the psychologist Jaak Panksepp of Bowling Green State University in Ohio, laughter is not uniquely human. Its acoustic, rhythmic, and facial precursors appear in other mammals, particularly in juveniles while they are at play, pointing to the role of evolution in human laughter. Second, the pleasure of laughter is neurologically based. It activates the dopamine (‘reward’) centre of the brain. Laughing – in many ways – has the same effect on social partners as playing. While the pleasure of playing is a way for juveniles to bond with each other, the pleasure of laughing is a way for adults to do so, as across mammalian species, adults rarely ‘play’. Shared laughter is as effective as playing in finding others to be a source of joy and satisfaction. Thus laughter biologically reinforces sociability, ensuring the togetherness needed for survival. However, laughter is not only key to survival. It also is key to understanding others, including what it reveals about infants. For example, infants can employ fake laughter (and fake crying!) beginning at about six months of age, and do so when being excluded or ignored, or when trying to engage a social partner. These little fake-outs show that infants are capable of simple acts of deception much earlier than scholars previously thought, but which parents knew revealed infants’ cleverness. Similarly, the psychologist Vasu Reddy of the University of Portsmouth has found that, by eight months, infants can use a specific type of humour: teasing. For example, the baby might willingly hand over the car keys she’s been allowed to play with, but whip her hand back quickly, just before allowing her dad to take possession, all the while looking at him with a cheeky grin. Reddy calls this type of teasing ‘provocative non-compliance’. She has found that eight- to 12-month-olds use other types of teasing as well, including provocative disruption, as in toppling over a tower someone else has carefully built. Teasing is the infant’s attempt to playfully provoke another person into interacting. It shows that infants understand something about others’ minds and intentions. In this example, the infant understands that she can make her father think that she will relinquish the car keys. The ability to trick others in this way suggests that infants are maturing toward a Theory of Mind, the understanding that others have minds that are separate from one’s own and that can be fooled. Psychologists have generally thought children don’t reach this milestone until about four and a half years of age. Infants’ ability to humorously tease reveals they are progressing toward a Theory of Mind much earlier than previously thought. Additional evidence for this early Theory of Mind comes from studies showing that infants are quite capable of intentionally making others laugh, also by about the age of eight months. Infants do so by making silly faces and sounds, by performing absurd acts such as exposing hidden body parts or waving their stinky feet in the air, and by initiating games such as peekaboo that have previously invoked laughter. Knowing what another will find funny implies that infants understand something about another person, and use that understanding to their joyful advantage. This attempt to make others laugh is not seen among children and adults with autism, one feature of which is an impaired understanding of others’ social and emotional behaviours. Individuals with autism do laugh, but tend to do so in isolation or in response to stimuli that don’t elicit laughter in people without autism. They might mimic laughter, but not share it. In a sense, their laughter is non-social. Perhaps because infants are so young, we have been reluctant to credit them with understanding ‘funniness’. Their laughs are more often attributed to ‘gas’ (a myth long ago dispelled) or imitation, or having been reinforced for laughing in response to certain events – like Mom singing in an ‘opera voice’. As it turns out, getting the joke doesn’t require advanced cognitive skills. And much of what it does require is within the infant’s grasp. Although infants do imitate smiling, starting in the first few months of life, and prefer to look at smiles compared with negative emotional expressions, and although they might be reinforced for laughing at particular events, these are not sufficient explanations for infant laughter and humour. If they were, then imitation and reinforcement would need to account for most infant laughter, and this is simply not the case in life or in the research lab. In addition, it would suggest that infants are not capable of understanding new humorous events unless someone were available to interpret for them and/or to reinforce their laughter. Instead, research has shown that, within the first six months of life, infants can interpret a new event as funny all by themselves. So how do they do it? 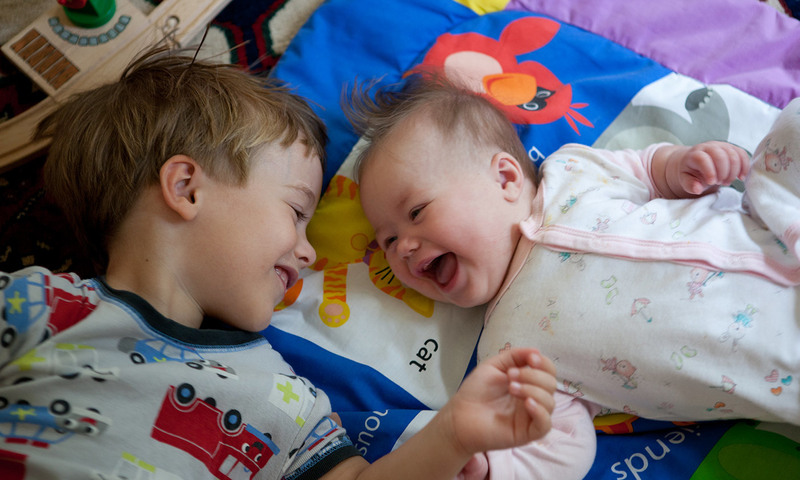 Like children and adults, infants appear to rely on two key features to detect funniness. First, humour nearly always requires a social component. Using naturalistic observations, the psychologists Robert Kraut and Robert Johnston at Cornell, and later the neuroscientist Robert Provine at the University of Maryland, discovered that smiling is more strongly associated with the presence of other people, and only erratically associated with feelings of happiness. That is, smiling is more likely to be socially rather than emotionally motivated. Thus, the presence of a social partner is one key component of finding something funny. Recall that the point of laughter is to be shared. But humour has a cognitive element too: that of incongruity. Humorous events are absurd iterations of ordinary experiences that violate our expectations. When a banana is used as a phone, when a large burly man speaks in a Mini Mouse voice, when 20 clowns emerge from a tiny car, we are presented with something bizarre and irrational, and are left to make sense of it. Infants, too, engage in this process. We showed six-month-olds ordinary events (a researcher pretending to drink from a red plastic cup) and absurd iterations of those events (the researcher pretending to wear the red cup as a hat). In one condition, we instructed parents to remain emotionally neutral during the absurd event. Not only did infants find the absurd version of the event funny, they found it funny even when their parents remained neutral. That is, infants did not rely on their parents’ interpretation of the event as ‘funny’ to find it humorous themselves. When repeated with five-month-olds, we got the same results. Even with only a month of laughter experience under their belts, five-monthers independently interpreted the funniness of an event. However, detecting incongruity isn’t the end of the story. Magical events are similarly incongruous, but adults, children and even infants do not laugh at them. Elizabeth Spelke of Harvard and Renée Baillargeon of the University of Illinois have observed that when natural laws are violated – a ball disappears into thin air or an object passes through a solid barrier – infants behave exactly as adults and children do: they don’t laugh, they stare. Why? Humour researchers theorise that although magic and humour both involve incongruity, only humour involves its resolution. In jokes, the resolution comes in the form of a punchline. It’s the ‘Ah-ha!’ moment when one gets the joke. It’s not known if infants are able to resolve incongruity, but that they laugh at humour and stare at magic suggests that they can. Perhaps they can simply distinguish that humorous events are possible and magical events are not, and this is enough to make the former funny. It’s up to researchers to solve this next piece of the puzzle. Until then, infants will have the last laugh.